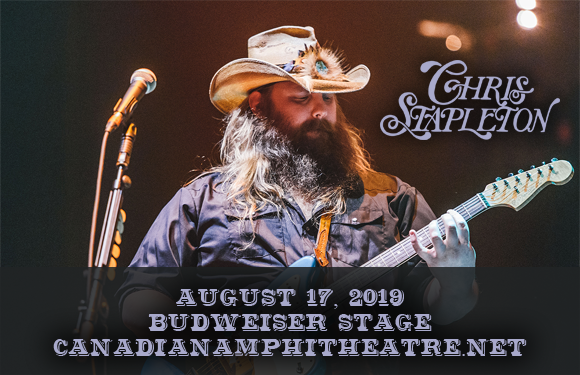 Multi-platinum-selling, Grammy Award-winning singer-songwriter Chris Stapleton comes to Budweiser Stage on Saturday 17th August 2019! The "Broken Halos" performer, who is nominated for three more Grammy Awards this year, continues his All-American Roadshow Tour and this stop will feature support from special guests Brent Cobb and The Marcus King Band! Don't miss your chance to see this phenomenal live act – tickets will sell quickly! American singer-songwriter, guitarist, and record producer Chris Stapleton began his career in Nashville, Tennessee in 2001 as a songwriter. To date, his songs have appeared on many artists albums including Adele, Brad Paisley, Dierks Bentley, Vince Gill, Peter Frampton, and Sheryl Crow, and he has co-written six number-one country songs including Kenny Chesney's five-week number-one "Never Wanted Nothing More", George Strait's "Love's Gonna Make It Alright", and Luke Bryan's "Drink a Beer". Before embarking on his solo career, Stapleton also sang lead in two bands, including The SteelDrivers (2008 – 2010). Stapleton made his solo debut in 2015 with the critically acclaimed album Traveller. The album reached number one on the US Billboard 200 and was certified triple platinum by the Recording Industry Association of America (RIAA). His second studio album was released in two instalments in 2017: From A Room: Volumes 1 & 2. Stapleton has received several awards for his solo work, including five Grammy Awards, seven Academy of Country Music (ACM) Awards, and ten Country Music Association (CMA) Awards.